I considered this, but this proved to be very expensive and not that much of a time saving. I also considered that in addition to the cost of several hundred dollars, I would have missed some of the most beautiful landscapes outside of Patagonia. I personally hate taking the bus anywhere. When you’re travelling by bus, you have a reasonable price point, but you have no control over your time of arrival, and no control about your comfort and seatmate. When going by the bus, you also have no choice for photo stops like Aconcagua (6,960 m), South America’s tallest mountain. This proved to be the best option, simply because it was 5 of us travelling together and we were able to use a friend’s car. After putting gas for the journey, we found that renting a car offered the most control, cheapest option per person and allowed us to stop where ever we wanted. First, you must have a notarized letter of permission from the car owner that says you’re legally able to take the car out of Chile. Next you have to have a special type of insurance for the entire time you’re in Argentina or else Chile won’t let you out and Argentina won’t let you in. You also have to carry proof of insurance with you at all times, especially at the border. If your insurance is expired when you try to come back to Chile, Argentina reserve the right to keep the car until you personally come back with valid insurance. Lastly, you have to have the customs form that lists when the car has gone out/in of Chile in the past. I was really excited about the crossing of the Andes since it offers magnificent mountain scenery of outstanding natural beauty, a close view of Mount Aconcagua, “The Colossus of America” and bragging right of driving the longest mountain range in the world and the second tallest after the Himalayas. You also get to drive through the 28 hairpin turns on the Chile side – those turns are pretty awesome coming down, but not going up. The Andes Mountain Range extends nearly 7,000 kilometres from Central America to Cape Horn, traversing seven countries: Venezuela, Colombia, Ecuador, Peru, Bolivia, Argentina and Chile. The distance between the two cities is 179 km (as the crow flies), but extends for 364 kilometers including local roads and the winding road through the mountain passes. The border between Chile and Argentina roughly follows the line along the highest peaks of the Andes. The “Los Libertadores” (Chile) or “Uspallata” (Argentina) crossing is one of the most important. 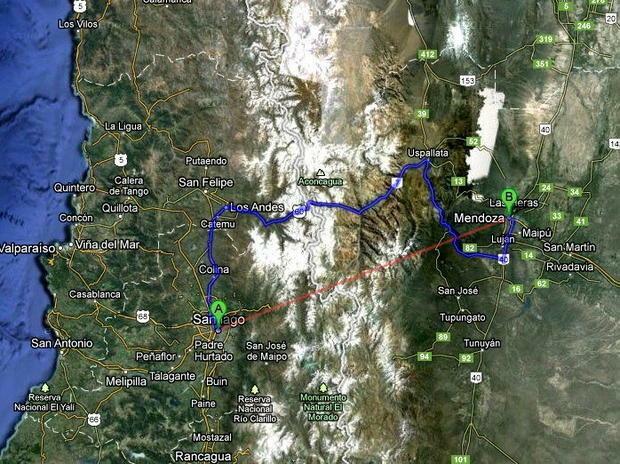 The “Los Libertadores/Uspallata” Pass links Santiago de Chile and the city of Mendoza in Argentina. In the vicinity of Los Libertadores is Mount Aconcagua (6,962 MASL; meters above sea level). Aconcagua is the highest mountain in both the Western and Southern Hemispheres. I took many shaky videos of the drive from the front seat of the car (I’m not known for my videography, but the you’ll definitely get a sense of all the colours and geological formations). The route is so pretty though, that I think it’s almost impossible to take a bad picture or even a terrible video and I am pretty great at taking terrible video – some of these videos might make you motion sick, but that’s ok … you can look at pictures. If you ever wondered if there could be a traffic jam along the Andes … I’m here to answer that question. There’s currently construction on the Chilean side of the border to make the road safer and the countries have agreed alternate traffic. This creates a bit of a mess, since if you miss the driving window, you’ll have to wait at least 30 mins. Total driving time should be around 5 hours. In our case, it took us 7 hours of driving time because we had to wait in a huge line at the border. Here’s what you do while you’re waiting! After one is done with all the traffic, then you’ll have to line up at the border. The cross over from the Chilean side to the Argentine side is actually not bad at all … compared to the crossing from the Argentine to the Chilean side. They don’t like you taking pictures … but whatever .. I laugh in the face of police! The drive is very picturesque and the changes in the terrain are quite dramatic.